By Dennis W. Viau; modified from a recipe in Saveur Cooks: Authentic Italian. Tagliatelle with Prosciutto is supposedly a classic dish in Bologna, Italy, but unlike their world famous ragu, this dish is rarely seen anywhere else. I make it with homemade pasta, as I do many pasta dishes, but you can substitute with fettuccine, linguine, or any pasta you prefer. Purée the tomatoes in a food processor or blender. Set aside until needed. Dice the prosciutto and place in a large saucepan over low heat. Cook about 5 minutes to render the fat. Meanwhile, heat milk to almost boiling and keep warm. Season the cooked prosciutto with black pepper and add the heated milk. Bring to a boil and reduce the heat to medium-low. Simmer, stirring occasionally, until almost all the liquid has evaporated, about 10 minutes. Watch it closely. Add the stock and puréed tomatoes to the prosciutto, bring to a boil, reduce the heat and simmer over low heat until the sauce is thickened to the desired consistency, up to an hour. 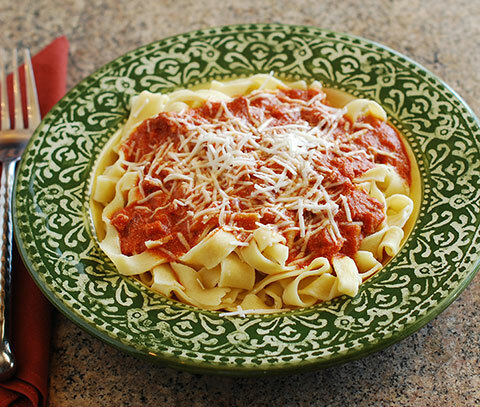 For this dish, a slightly watery sauce, rather than a thick ragu, is traditional. Test of salt and adjust, if necessary. My sauce did not need salt. Cook the pasta according to package directions until al dente, then drain. Either add the pasta to the sauce and mix well to coat evenly, or plate the pasta and add the sauce on top. Serve with additional grated cheese for garnish.